That moment was my epiphany and I knew I had to do something. It was so hard at first because I lost my mojo with everything- I was exhausted chasing my 3 kids all under the age of five at the time, and didn’t have any confidence to start working out. I was armed with a post-graduate degree in urban planning, a successful career in the corporate world and too many pant suits to count, but I didn’t want to return to that world. It would be too many 15 hour days and no longer fit in with my new life as mom. The reality was sinking in that I was now a stay-at-home mom and stuck in a rut where I thought I was losing my identity and now ….my body. I didn’t have a passion for anything. I felt well…BLAH! Don’t get me wrong, I adored my family – my kids and husband were my life. I was always there for them making sure everything was ready for everyone else. But it was that day, with that very question, that I had realized I wasn’t doing anything for myself anymore. So I started slowly, taking 45 min spin classes that I could work around my kids’ schedules. And there was an added benefit… I could hide in the back row and not feel awkward. I got hooked immediately. I went to class religiously. I found my groove, my community…my safe place. I craved my daily dose of endorphins but more than that I felt happier. The feeling of being fit and strong was empowering, my body was starting to come back, and I regained my confidence. My confidence boosted so much that I felt inspired to take more classes and try different things such as strength, conditioning and resistance training. I remember being in a HIIT class thinking about how I would change up the exercises and how I would program the class. BOOM!!! It hit me…I can do this too! Not to overwhelm myself, I thought I would get certified just for my own personal development and I’d see where it would take me. All it took was for me to teach one class and the deal was sealed. I loved this job with every fiber of my being. Teaching, motivating and inspiring people to be fit was so natural for me. Being a fitness instructor, helped me gain control back of my health and my life. I loved being creative with my workouts, I could get up in the early morning without hesitation, I would travel near and far for any gig across the City. Why? Because I loved and believed in what I was doing. I connected with people through fitness. I inspired them to believe in themselves -that no class is “too hard” for them, that working out doesn’t have to be “complicated” and that we can all “push past our limitations” and while we are at it “let’s have some fun” working out. I make a strong effort to communicate with everyone, not by speaking but by listening to them. And that has helped me gain their trust. One of the fundamental ingredients in a relationship. If they trust me they will be consistent with their fitness routine and as a result they will ultimately achieve their fitness goals. It’s a win-win situation. I believe that any fitness instructor can teach people how to lunge and squat but the instructor that cares deeply about connecting with their clients and makes them feel like they belong is what matters most. After training many fitness enthusiasts in Toronto, I felt I wanted to do more. I wanted to reach an audience that doesn’t have access to the Soul Cycles and Equinoxes of the world, I wanted to reach an audience that has not yet grasped the importance of being physically fit and healthy – not for the sake of looking like the next Kardashian but to build a stronger, healthier body. And most importantly, I wanted to reach an audience where building confidence and a healthy self-esteem is critical. This audience would be approaching 5 feet and ages 9+ … tween and teen girls! 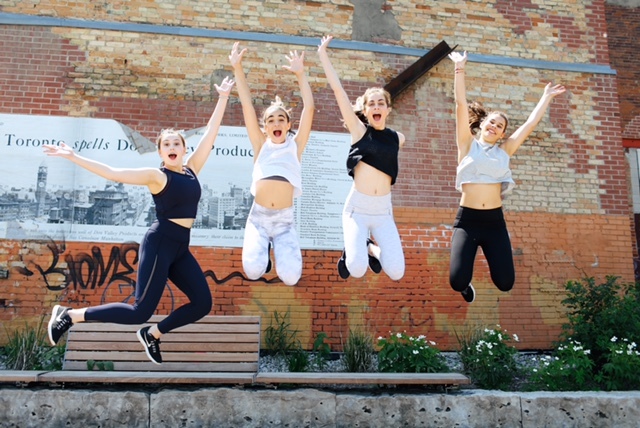 GiFT – Girls In Fitness Training is more than just any fitness class or program it is a community and a movement of young girls learning to be fit, healthy, feel good about themselves and gain more strength and confidence. I truly believe there is a reason for everything. When I reflect back on my journey and I think about what I went through over 7 years ago – fitness was my saviour. The feeling of being fit, strong, empowered, body proud, confident is what made me who I am today. It is precisely why GiFT was born! If fitness helped me find my way, I can only hope that GiFT will give this next generation of young women the tools they need to successfully navigate the world to be UNSTOPPABLE. This entry was posted in healthy living, life & wellness coaching and tagged fitness, Motherhood, yoga teacher training. Bookmark the permalink.